During the Georgian era, new silver finds in South America occurred on a very regular basis and production was booming. 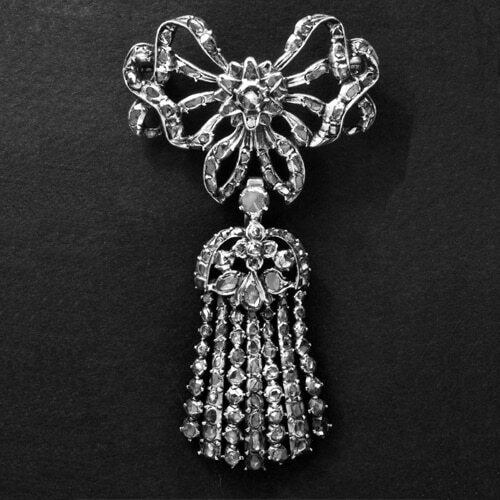 The fashion of setting diamonds in silver which had begun in the Baroque period became common. Diamonds were flowing into Europe in numbers never seen before from India and from 1727 on from Brazil where new deposits were discovered. 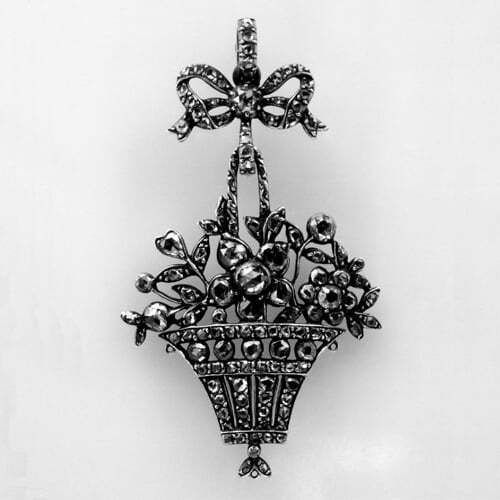 Fine jewelry was often executed in gold with silver topped front sides but items composed completely of silver certainly weren’t uncommon. 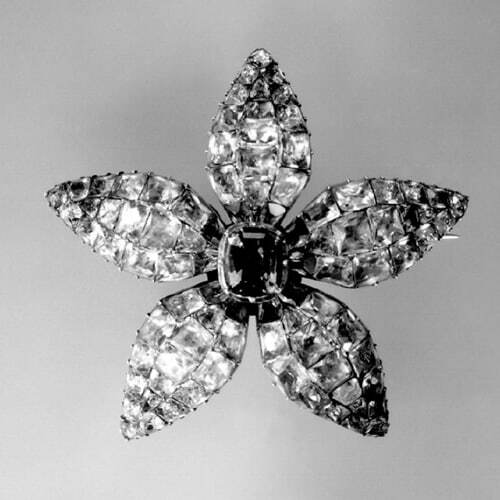 The typical cut-down collet settings of Georgian jewelry are almost always composed of silver, complimenting the ‘ white’ color of the diamonds they would hold. 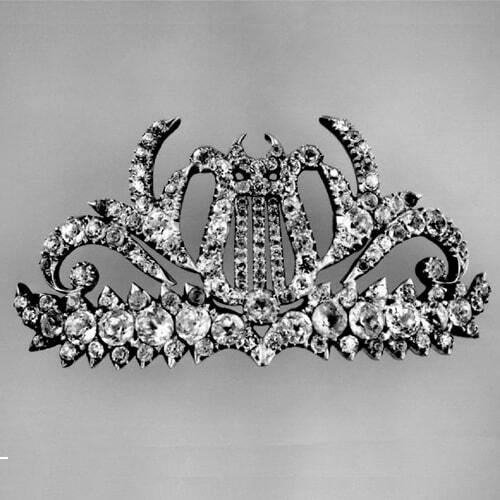 The manufacturing technique of die striking started to be used for jewelry in 1777. This method comprises the stamping and cutting of precious metal components with the aid of dies and presses or drop hammers. These components could then be assembled by hand to create a complete item. This relatively inexpensive manufacturing method heralded the first mass-produced jewelry lines and these items could be sold for far cheaper prices than handmade items. Naturally, the lesser expensive metals were used a lot in this process and with silver being ported into Europe by the boatload large quantities of die struck silver jewelry reached the markets. A Pair of Closed-Back Silver Ear-Rings Set with Green and Colourless Pastes. 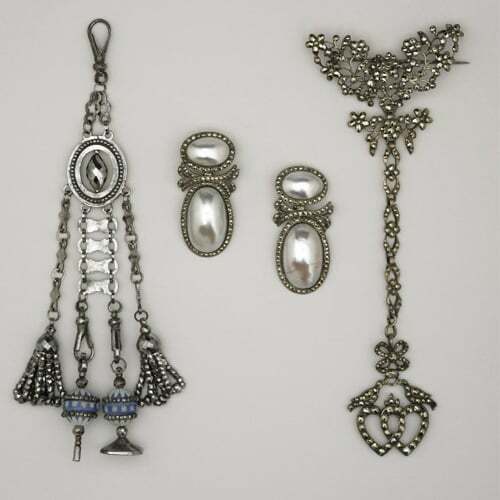 Pair of Earrings Each with Four [[Coque de Perle]] (Nautilus Shell ‘Pearls’); Bordered with Iron Pyrites Set in Silver. Hair-Ornament with a Centre in the Form of a Lyre. Gilded Silver with a Closed-Back and Set with Pastes. 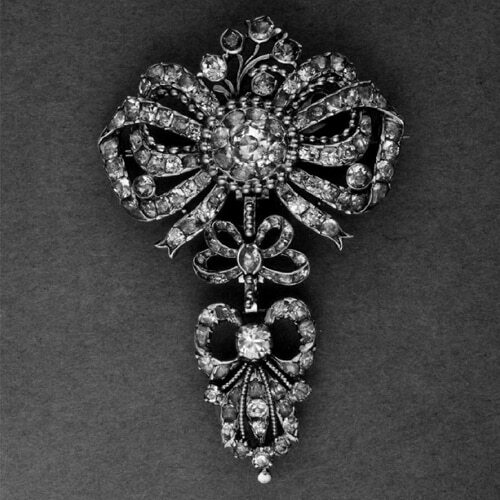 Brooch in the Form of a Ribbon-Bow Surmounting an Epaulette. 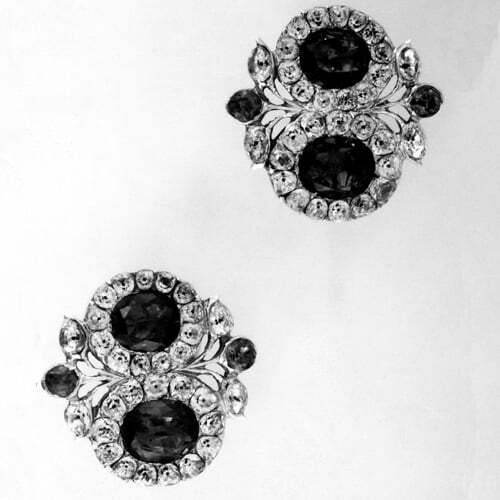 Silver with a Closed-Back and Set with Diamonds. Hair-Pin Ornament in the Form of an Open Flower Set in Closed-Back Silver with Calibré -Cut Emerald-Green and Colourless Pastes. 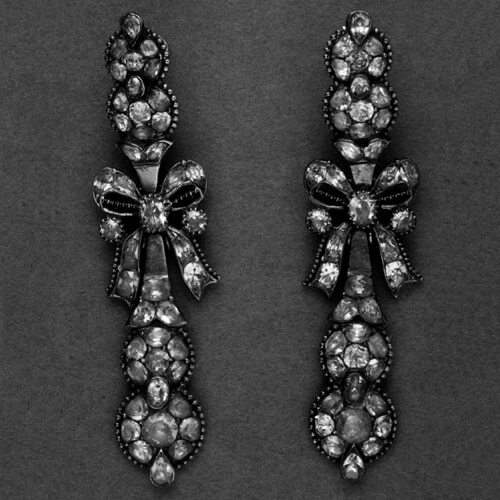 Pair of Earrings. Ribbon-Bows with Long Pendants. Silver and Gold with Closed-Backs and Set with Yellow Chrysoberyls, the Settings Bordered with Gold Beads. 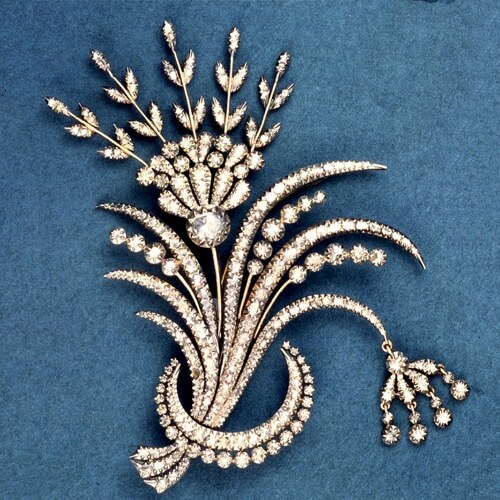 Aigrette in the Form of Crescent with a Trembler Spray of Flowers. Silver and Gold with a Closed-Back and Set with Diamonds. Pendant in the Form of a Triple Bow. Silver, Bordered with Gold Beads, Closed-Back, Set with Yellow Chrysoberyls. Pendant in the Form of a Flower-Filled Basket. Silver with a Closed-Back Set with Diamonds and a Central Rose on a Trembler Spring.